More Hispanic registered voters say they have given “quite a lot” of thought to the upcoming midterm elections compared with four years ago and are more enthusiastic to vote this year than in previous congressional elections. But they lag behind the general public on some measures of voter engagement, according to recent Pew Research Center surveys. Overall, 52% of Latino registered voters say they have given the coming November election “quite a lot” of thought, a 16-percentage-point increase from what they said about the last midterm election in 2014. In addition, a majority (55%) of Latino registered voters in 2018 say they are more enthusiastic about voting compared with previous congressional elections, up from 37% in 2014. More than 29 million Hispanics are eligible to vote, a new high, up 4 million from 2014. (Eligible voters are U.S. citizens ages 18 years and older.) However, Hispanic voter turnout has long trailed that of other groups. In 2014, an estimated 27% of Hispanic eligible voters cast a ballot, a record low and far below the turnout rate among black voters (41%) and white voters (46%). This year’s election comes at a time when most Latinos have grown dissatisfied with the nation’s direction and have more concerns about their place in American society. They also overwhelmingly disapprove of the president’s performance and see his administration’s policies as harmful to Latinos. Even so, not all Latinos feel the same way. Latino Republicans are generally more upbeat than Latino Democrats on these measures. Similar shares of both groups say they have given quite a lot of thought to the upcoming election and say they are more enthusiastic to vote than in previous congressional elections. Hispanic registered voters affiliate with the Democratic Party over the Republican Party by a more than two-to-one margin. About six-in-ten Hispanic voters (62%) identify with or lean toward the Democratic Party, compared with 27% who identify with or lean toward the Republican Party. These shares have remained steady since the last midterm election. The party affiliation of Latino registered voters mirrors how they intend to vote in the congressional elections, according to a September survey. If the election for Congress were being held today, 63% of Latino registered voters said they would support the Democratic congressional candidate in their district, while 29% said they would support the Republican candidate. 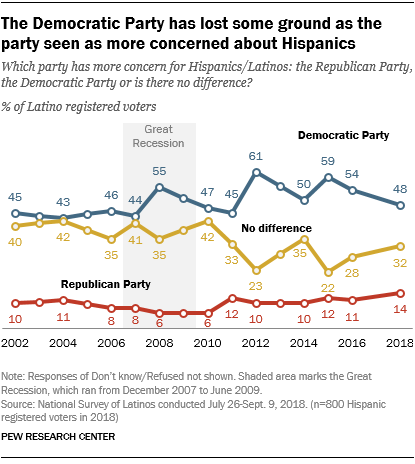 About half (48%) of Latino registered voters say the Democratic Party has more concern for Latinos than the Republican Party, while a third (32%) say there is no difference between the parties and 14% say the Republican Party has more concern. However, the Democratic Party has lost ground since 2016. The share of Hispanic registered voters who say Democrats have more concern for Hispanics than Republicans has declined in recent years after reaching a recent high of 59% in 2015. Meanwhile, the share of Hispanic voters who see no difference between parties is up, from 22% in 2015 to 32% today. 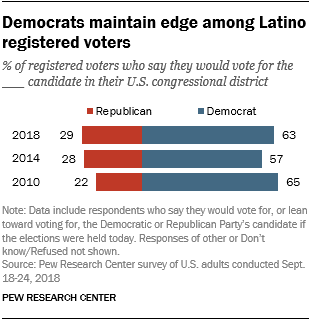 A higher share of Latino Democratic voters say their party is more concerned for Latinos, compared with the share of Latino Republican voters who say the same about their own party. About seven-in-ten Latino Democratic voters (72%) say the Democratic Party has more concern, while 24% say there is no difference. Fewer than half (45%) of Latino Republican voters say the Republican Party has more concern for Latinos, while 40% say there is no difference between the parties.